Pardon this clumsy post: This is a test of Blogger's BlogThis/reblog functionality. In the bottom picture of the original post (click on post title to see it) you can see that I used kitchen twine and an old onion bag to secure a piece of comb to a modified Warré frame. 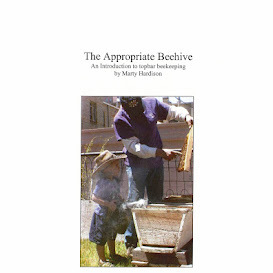 I wanted the bees to be challenged, to give them time to attach the comb to the demi-frame. The bees chewed up the string and managed to throw one piece outside. It looked like a ratty piece of cheesecloth. Another laid on the screened bottom all Summer long. I don't know what happened to the third. Six months later, we've only just found the tiniest bit of onion bag on the bottom board, confirming that the bees can indeed chew through the plastic. During the Summer, the bees turned the drawn comb into honey stores, so I can only assume they successfully attached it to the demi-frame. However, they braced the comb to the back of the hive, indicating that they felt the comb was heavy and needed the extra support. In the spring, we'll see if we can get it out, and remove any bits of string/plastic remaining. Then we'll let you know how helpful the demi-frame is. The demi-frames are demi-working. The bees built comb in the frames but also braced the combs to the window. What's your opinion? Join the conversation by adding a comment. What Should I Be Doing With My Bees This Month? You're Invited to Mead Jubilee 2016! It all started with chickens. Not allowed. Ducks? Nope. Can you believe the city (just east of Denver) has a ban on ice cream trucks? Seems odd that bees are okay, but I tend not to question a good thing. Did you know that about 80 percent of our food crops are pollinated by bees and their wild cousins? From alfalfa (cattle feed) to zucchini, so many crops are entirely dependent on bees for pollination, our survival depends on their survival. The biggest challenges that feral bee colonies face are urbanization and monoculture farming. Kept honeybees are key but lush green lawns and acres-upon-acres of a single food source with a brief bloom period aren't enough to sustain them. On top of that, now there's CCD and the bees desperately need our help. By helping the bees, we help ourselves. So, that's why beekeeping. Now all we need is our own farm. Awesome Inc. theme. Theme images by friztin. Powered by Blogger.